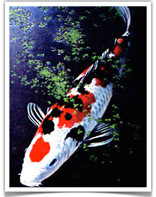 Name : "TAISHO SANSHOKU" KOI PRINT"
This magnificently colored lithiogrpah of Dennis Blalock’s original oil painting is a masterpiece of composition and natural beauty. The fish in the painting is a beautiful red, black and white variety of koi called a Taisho Sanshoku (also known as Taisho Sanke). Koi have long been valued for their beauty and grace in Japan. Awareness and interest in these lovely animals continues to increase rapidly in the United States and many other countries. “Taisho Sanshoku” is a marvelous representation of the fish the Japanese call “living jewels.” The diagonal thrust of the fish is balanced by the opposing diagonal of lacy duckweed. The colors are rich but harmonious. The counterpoint of light and dark, pool surface and pebble bottom, inspire a feeling of peace and beauty. The prints have been prepared on the finest acid-free museum quality paper and were printed utilizing a special process to achieve maximum color fidelity and saturation. Each print is hand signed and numbered by the artist and comes with a Certificate of Authenticity. Dennis Blalock is an extremely talented artist whose wide variety of work is commanding increasing interest. He sculpts and paints amongst the Catoctin Mountains of Maryland near Hunting Creek Fisheries. Mr. Blalock’s work has been exhibited in Europe, the Far East, and across America.